Android 4.4 introduced a number of security enhancements, most notably SELinux in enforcing mode and verified boot. Android's verified boot implementation is based on the dm-verity device-mapper block integrity checking target. Device-mapper is a Linux kernel framework that provides a generic way to implement virtual block devices. It is used to implement volume management (LVM) and full-disk encryption (dm-crypt). Device-mapper works by essentially mapping a virtual block device to one or more physical block devices, optionally modifying transferred data in transit. For example, dm-crypt decrypts read physical blocks and encrypts written blocks before committing them to disk. Thus disk encryption is transparent to users of the virtual DM-Crypt block device. Device-mapper targets can be stacked on top of each other, making it possible to implement complex data transformations. In this context, dm-verity is a block integrity checking target: it was initially developed as part of the Google's Chromium OS project with the purpose to implement a device mapper target capable of validating the data blocks contained in a file system. This means that it verifies the integrity of each device block as it is being read from disk. If the block checks out, the read succeeds, and if not the read generates an I/O error as if the block was physically corrupt. As for dm-crypt, this process is transparent to the applications reading those blocks. The final purpose of dm-verity is to guarantee the integrity of a volume against corruption or malicious attacks. Under the hood dm-verity is implemented using a pre-calculated hash tree which includes the hashes of all device blocks. The leaf nodes of the tree include hashes of physical device blocks, while intermediate nodes are hashes of their child nodes (hashes of hashes). 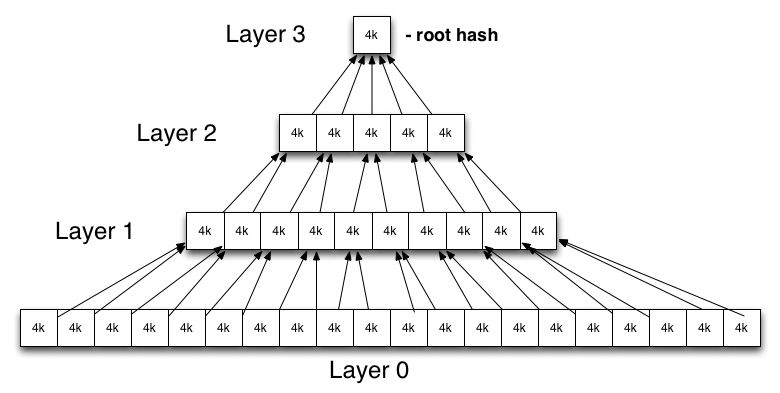 The root node is called the root hash and is based on all hashes in lower levels. A change even in a single device block will result in a change of the root hash. Therefore in order to verify a hash tree we only need to verify its root hash. Like Chrome OS, Android also uses the kernel's DM-Verity target, but the cryptographic verification of the root hash and mounting of verified partitions are implemented differently from Chrome OS. The RSA public key used for verification is embedded in the boot partition under the verity_key filename and is used to verify the dm-verity mapping table. This mapping table holds the locations of the target device and the offset of the hash table, as well as the root hash and salt. The mapping table and its signature are part of the verity metablock which is written to disk directly after the last file system block of the target device. A partition is marked as verifiable by adding the verify flag to the Android-specific fs_mgr flags filed in the device's fstab file. When Android's file system manager encounters the verify flag in fstab, it loads the verity metadata from the block device specified in fstab and verifies its signature using the verity_key. If the signature check succeeds, the file system manager parses the dm-verity mapping table and passes it to the Linux device-mapper, which use the information contained in the mapping table in order to create a virtual dm-verity block device. This virtual block device is then mounted at the mount point specified in fstab in place of the corresponding physical device. As a result, all reads from the underlying physical device are transparently verified against the pre-generated hash tree. Modifying or adding files, or even remounting the partition in read-write mode, results in an integrity verification failure and an I/O error. enable the verified boot in the fstab for the system partition. During normal use of the device, every block that is read will be checked against the hashes present in the hash tree: if there are differences, dm-verity will generate an I/O error and it will make the corrupted blocks unreadable. For performance reasons, when read into memory, the block is hashed in parallel. The hash is then verified up the tree. And since reading the block is such an expensive operation, the latency introduced by this block-level verification is as low as possible. While dm-verity sounds great against malicious attacks, it also means that a detected single byte corruption will result in an entire block becoming inaccessible, leading to the kernel returning I/O errors to userspace on verified partition data access. This could, in theory, also lead to unreadable (safe) files. For this reason, while everything said until now is valid from Android 4.4 onwards, there are some further changes to how a device behaves when dm-verity is enabled from Android 7.0: one of those is the forward error correction (FEC). A benefit of the integrity verification already performed by dm-verity, is that it's possible to tell exactly where the errors are in case of corruption. So, using some error correction codes, it's technically possible to recover damaged files. If the FEC is enabled, the error-correcting codes (Reed–Solomon in the Android case) are spread over the entire partition, shipping redundant encoding data with the system image: this makes it possible for devices to recover from the loss of up to 16-24 MiB of consecutive blocks anywhere on a typical 2-3 GiB system partition with only 0.8% space overhead and no performance impact unless corruption is detected. This improves both the security and reliability of devices running Android. As dm-verity is a kernel feature, in order for the integrity protection it provides to be effective, the kernel which the device boots needs to be trusted. On Android, this means verifying the boot partition, which also includes the root file system RAM disk and the verity public key. This process is device-specific and is typically implemented in the device bootloader, usually by using an unmodifiable verification key stored in hardware to verify the boot partition's signature. On Android this is called verified boot, the Google implementation of chain of trust: verified boot guarantees the integrity of the device software starting (ideally) from a hardware root of trust up to the system partition. During boot, each stage verifies the integrity and authenticity of the next stage before executing it.